Wow you the fun continues! After the "summer from hell" due to late July, early August thunderstorms, now we are in drought mode. Unless you are watering a minimum of 2x daily, your seed is NOT staying damp and isn't germinating. The seed is tested by the state to insure it is viable = will germinate when kept moist. ITS NOT "BAD SEED"! In fact, to my knowledge it is the highest rated, most expensive blend sold in Nashville! Please set to irrigation to water once before lunch and once in the afternoon. You will find out how good your irrigation coverage is based on where seed does not germinate. Here is the good news. Soil temps right now are what they normally are about in mid September. The only requirement for fescue germination is water and warm soil temps. Therefore, we will be able to germinate fescue thru Thanksgiving! I am often asked, "what if we get a frost in October". It takes SEVERAL consecutive days of forst and near freezing temps to cool soil below germination temps. I welcome a freaking frost! 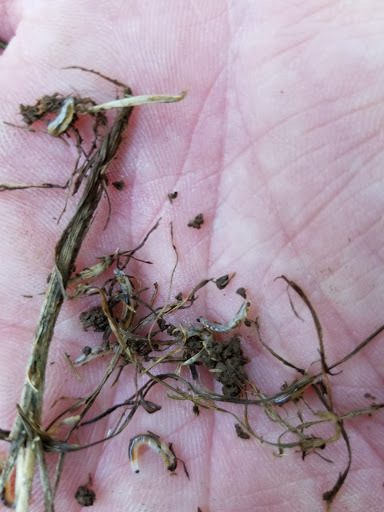 We still have nutsedge and other summer weeds like spurge germinating daily due to high soil temps! Even the weeds are confused. Once we have finished all aeration /seeding, AND we have had at least 2 soaking rains, we will return to reseed as needed. In 20 years, we have had to reseed some yards in spring only 1 time. ZERO customers have ever been dissatisfied with our final seeding product. We ALWAYS make it right. Do we miss spots?Sometimes. Do we fix them? Always. The reason you see seed germination in shady spots 1st,is that the sun doesn't bake the seed dry in the afternoon. The sunny areas need rain to happen, or perfect irrigation timing and coverage. We guarantee all aeration /seed jobs every year. If it never rains again, thats the only way we will fail to reestablish your lawn! IF YOU HAVE IRRIGATION AND HAVE WATERED AS INSTRUCTED AND IT HAS BEEN 30 DAYS SINCE WE SEEDED, THEN YOU CAN CALL FOR IMMEDIATE TOUCH UP. Otherwise, wait on rain or buy a sprinkler and please be patient. Thank you for your business! Seeded this lawn 18 days ago. We treated with bifenthrin(granular) at time of seeding. 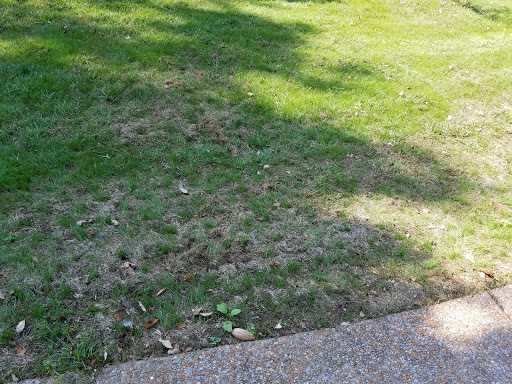 Customer noticed grass not doing well in some spots. I picked up a handful of dead seedlings and grabbed 6 live baby armyworms! Bifenthrin effective as contact control, but the residual is not effective more than 2 weeks when watering daily for seed germination. I have NEVER seen multiple generations in same year. If we have seeded your lawn in 37205 or 37215 and you notice new grass areas quickly deteriorating, please contact us ASAP! This is major problem. Need a under 50 degree night to stop more generations. In 2017,we will have to change our program to stop this situation. A hot wet late summer year = armyworm invasion. If lawn on dry side, they won't hit you, but seed won't germinate. Very random, side by side yards we treat, 1 hit 1 not. Only difference is how wet they were when moths arrived in late August.